Is your time consuming you? Are your tasks too time consuming? Are you feeling overwhelmed with all that you have to do and plan for? I can offer you some relief! I offer individual and group consulting services. 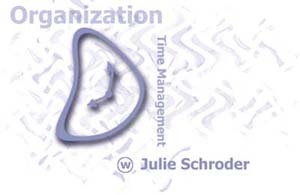 I can teach individuals how to organize and schedule their days, weeks, months, and years. I can help people prioritize activities and work, and show them how to use their time to their advantage as well as cut out the time wasting activities. Time Management can be used in the home, at work, and in any other area in one's life.